With five Oscar awards, another six nominations, and a Golden Globe for Best Director for Martin Scorsese (Taxi Driver), there’s no doubt Hugo is a movie that’s worth a watch, but be warned, it does require some patience. Hugo starts out slow, casually strolling along as it reveals its Paris train station setting, which is gorgeously rendered, and spends time with its various patrons, musicians, the flower girl (Emily Mortimer, Our Idiot Brother), the newspaper seller (Richard Griffiths, Pirates of the Caribbean: On Stranger Tides), a lady whose dog is thwarting a possible romance (Frances de la Tour, Harry Potter and the Deathly Hallows Part 1), the station inspector (Sacha Baron Cohen, Bruno) and others. If you can stay with the film through this meandering beginning into the meat of the story, you’ll be rewarded with a movie that tells a rich tale of loss, family and dreams. 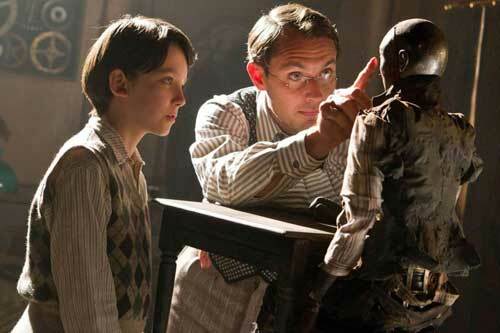 Based on the book by Brian Selznick , Hugo follows an orphan boy, Hugo Cabret (Asa Butterfield, Nanny McPhee Returns), who is a whizz at mechanics and steals gears, etc., to help mend an automaton his father (Jude Law, Sherlock Holmes) brought home shortly before he was killed. In one robbery attempt, Hugo is caught by the owner of the station’s toy shop (Ben Kingsley, Shutter Island), who gets outraged when he finds the notebook Law had left with notes on the automaton. Hugo follows him home and meets Chloe Moretz (Let Me In) and the two youngsters go on an adventure to fix the automaton and find out the meaning of its drawing. It’s the perfect film for Scorsese, a lover of classic films, as Hugo‘s mystery revolves around the wonders of the movies by George Melies — you know, the director whose silent movie featured the rocket that crashed into the face on the moon. And it’s obvious that Scorsese has a lot of respect and love for this story. His sets are sumptous, especially the re-imaginings of Melies’ great works. And they all look stunning in Blu-ray’s high-definition picture, coupled with the Oscar-winning sound in fantastic 7.1 DTS-HD. Although Hugo is based on a children’s book, the movie will appeal more to adults, in both pacing and eye candy. But for film lovers, it’s definitely a keeper. On the special features side, the Blu-ray has another treat for film lovers: the featurette “The Cinemagician: George Melies.” The piece explores the real life of the silent movie director and tells us how closely the movie follows it. With interviews from Scorsese and others involved in the film as well as movie historians, “The Cinemagician” is an interesting intro to the life and work of this visionary artist. Another extending-the-movie featurette, “The Mechanical Man at the Heart of Hugo,” is a fascinating look at the history of automatons. Experts tell about the many robots that could draw multiple pictures, play instruments and perform other tasks, all long before computers. The production of Hugo is looked at in three more featurettes: “Shoot the Moon: The Making of Hugo,” “Big Effects, Small Scale” and “Sacha Baron Cohen: Role of a Lifetime.” The first is the least interesting, featuring a lot of so-so’s a genius type of interviews with the actors and Scorsese. But the others are more entertaining.